We just finished participating in the 2018 Florida Mission of Mercy held on March 9 and 10 at the Lee County Civic Center. There were over two thousand volunteers including dentists, nurses, staff, equipment specialists, and others. There were over two thousand patients seen over the two days. My staff and I volunteered for two morning shifts and we saw over sixteen patients in that time. We received a lot of love and appreciation from these patients and we would like to do it again. Next year, it will be in Orlando. March 22-23, 2019. Remember, treatment is FREE to all, no qualifications needed, but it is first come first serve. See you in Orlando. At Essential Endodontics, we provide the best endodontic care to patients of all ages. When you visit our office, you will find a friendly and inviting atmosphere. Our endodontist, Dr. Heather Adu-Sarkodie has many years of experience in dental research, dental education and dental treatment. She has the knowledge and skill to provide the most up-to-date care available. Our staff, Ms. Kathy Tuttle, Ms. Jane Zenger, Ms. Debi Shea, and Ms. Catherine Reid will provide friendly competent assistance when making the appointment, during the visit, and follow-up care. Essential Endodontics is a dental specialty practice dedicated to the best root canal option possible within the full mouth treatment plan designed by the general dentist. While our main purpose is to use our resources and experience to relieve the patient's pain and to restore tooth health, we also recommend appropriate treatment options, educate the patient about pulpal and gum diseases, and discuss preventive techniques, thus maximizing the long-term prognosis of the entire dentition. 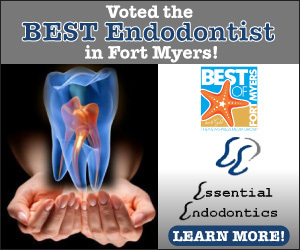 We are proud members of the American Association of Endodontists, the American Dental Association, Florida Dental Association and the Lee County Dental Association. for root canals and emergency dentistry. We are happy to announce that we now have surgical microscopes in our office. These enhance illumination and magnification in order to help treat even the most difficult cases. Also, we have a limited scope CT scanner. This allows us to take 3-D images and see teeth from different angles. We are then able to see anatomy that regular 2-D radigraphs do not show. For example missed canals in failed root canals, bone fractures in trauma. Thank you to all our patients who refer us to friends, family, co-workers, neighbors, people around town. It is such a compliment to me and my staff when you have a choice, but choose to come to us for kind, gentle treatment.